Samsung Galaxy NotePRO 12.2 is one of kind device. It an Android tablet (! ), Note, portable computer – in a word you can do anything with it if you just wish! Those in the UK looking to get their hands on it now have the chance to do exactly that. 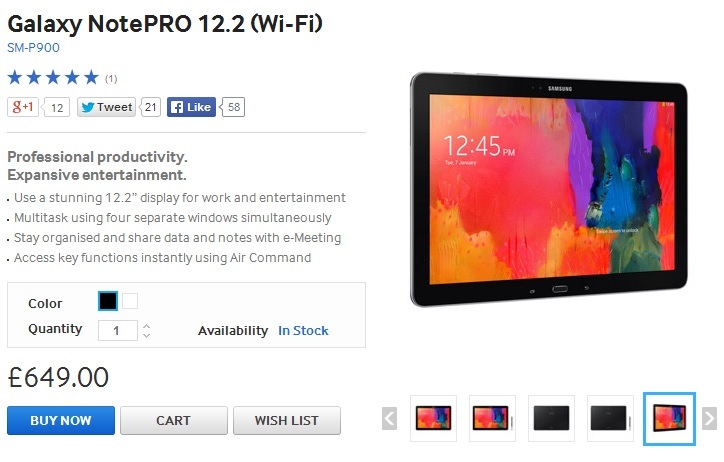 Samsung has announced that the 12.2 Galaxy NotePRO 12.2 is now available for trying out and purchasing in selected stores in the country, including Carphone Warehouse, John Lewis, and Samsung’s Experience Store in Westfield Stratford City. The gigantic Galaxy Note Wi-Fi only model is priced at £649 which is over $1060 in US currency. Both black and white version of this beast is up to sale. For your money you get a 1,600x2,560 screen and octa-core processor, packing four 1.9GHz and four 1.3GHz cores. It has 3GB RAM, 8-megapixel and 2-megapixel rear and front-cameras, 32GB internal storage, microSD slot and a 9,500 mAh battery. The tablet comes with the S Pen like all other devices in the Galaxy Note family, and on the software side of things, you get Android 4.4 KitKat with Samsung’s new Magazine UX home screen and a dedicated multitasking button instead of the now obsolete menu button. Check out Samsung UK Website if you are interested to grab this thing. The NotePro was unveiled alongside the almost-identical Galaxy TabPro at CES last month, and has been up for pre-order for a week. The difference between the two is that the NotePro comes with an S Pen stylus.